Each month, we ask one of our beautiful Dress Dreams Brides to tell us all about their dress journey from start to finish. When my long suffering boyfriend popped the question I headed straight to Dress Dreams a week later. I had lived in a flat opposite the shop for about two years and walked past the shop daily. I was always stopping to admire the gorgeous dresses in the window. They were not like any bridal dresses I had seen before, such variety ranging from Boho Chic to Beautiful and Blingy. I created a scrap book of ideas and dress styles that I liked. One of the dresses in my scrap book was a lace, boho dress with sleeves by Riki Dalal which I had fallen in love with from the Dress Dreams Website. I knew that I wanted sleeves, as I have never felt confident showing them. I had been nervous before my appointment but Shereen and Helen were so friendly and helpful that I felt so relaxed and had such fun. I tried on 5 dresses, the last being the lush lace Riki Dalal dress. As soon as I put it on, I knew it was the one. That sounds so cheesy but it is so true. The dress was a two piece and had a beautiful long train. The skirt was full without being restrictive and would enable me to wear it on my horse before the ceremony. I also bought an additional short skirt so that when the party got going I could dance the night away without my train getting trodden on. On the morning of the wedding I was so excited to put my dress. I have never felt very confident in the way I looked but on my wedding day I felt pretty, comfortable and confident. I did not wear a veil with my dress as I was going for a relaxed boho feel, instead my hair was styled by father-in -law and I wore a floral head piece made by my florist. Having my father-in-law do my hair felt so special. My bridesmaids wore blush pink multi-way dresses to complement the pink and orange tones of the flowers. Walking down the aisle, I couldn't stop smiling and my eyes did not leave Sam's face. We were both smiling at other, I didn't notice any of the guests. At the end of the ceremony, it started to rain but this just enhanced the day and the pictures. It was perfect! 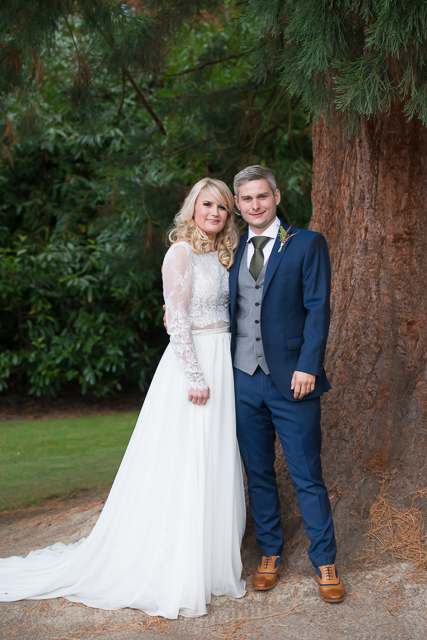 Ah, Lizzie it was our absolute pleasure to help you find your dream dress! Who couldn't love a wedding with not one but TWO horses, topped off with a couple of gorgeous dogs? !